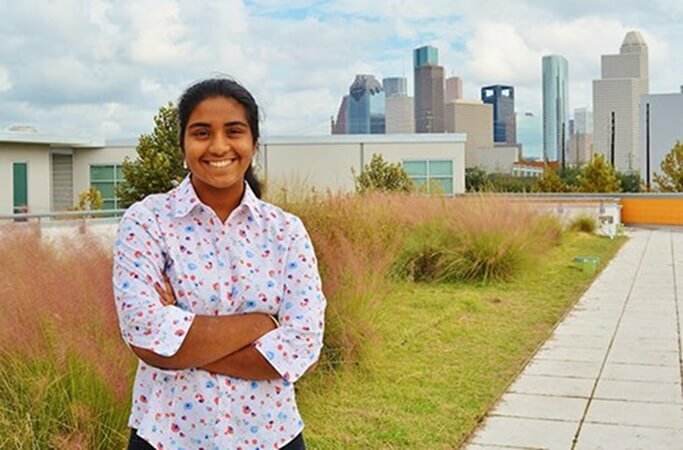 The first Indian American to be awarded Houston’s Youth Poet Laureate title, Rukmini Kalamangalam studies at Carnegie Vanguard High School in Houston Independent School District. This prestigious honor from Houston Mayor’s Office of Cultural Affairs, Houston Public Library, and Writers in the Schools entitles Rukmini to a number of benefits including a scholarship. Being a poet laureate of Houston, she will act as Cultural Arts Advisor to Houston Mayor’s Youth Council. Her work will be published in Houston Chronicle for one year. She is also eligible for one-year tenure of mentorship from Houston’s Poet Laureate, Deborah D.E.E.P. Mouton. Rukmini Kalamangalam applied for Houston’s Youth Poet Laureate title several times earlier. She was required to submit five poems and three essays along with a resume to enter the competition every time. A board of experts interviews five finalists among the participants and selects only two every year. Houston Mayor Sylvester Turner selected Rukmini for Houston’s Youth Poet Laureate 2017 title. Rukmini does not want to rest on her laurels. Rather, she is all set to create a dedicated space for budding poets and young artists to share their creative work and experiences with each other. She does also plan to start a column in a local publication for students to get their poems published. Houston’s Young Poet Laureate 2017, Rukmini Kalamangalam knows no full stop until she initiates poetry readings in public places. Our heads still bowed as the rain evaporated, leaving only stillness behind. This story is part of our continued effort at Indian Eagle to promote achievements of Indians in USA. We not only strive to make US to India travel cheaper but also cater inspiring stories, community news, and travel updates to Indian Americans through our free newsletters. If you have any story to tell or share, do feel free to write to us at share@blogbox.indianeagle.com.